Cheng Shifa (1921-2007) acquired a reputation as an accomplished book illustrator and figure painter. However, he showed more interest in flower and bird paintings in his later years and published a volume of this genre in 1979. The three leaves displayed here [EA1995.175.i, EA1995.175.b, and EA1995.175.l] are from an album [EA1995.175] painted around that time, demonstrating looser brushwork than his figure paintings. 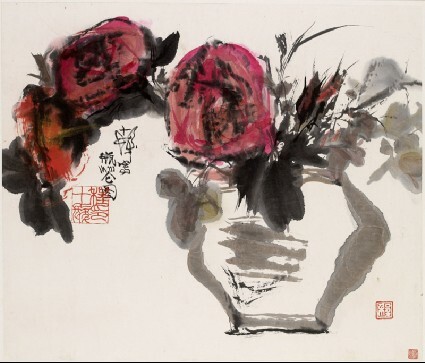 The title, Flowers in a Vase, does not provide much information but the flowers depicted here may be loosely linked to plants in the family of Rosaceae, which has numerous cultivars nowadays and is extensively cultivated in China as an ornamental plant.